This Bull Moose was eating bitter brush in the snow near Moose, Wyoming. 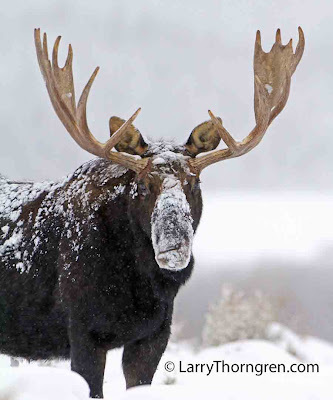 Moose move out of the wet marshes when they freeze and spend the winter in sage-brush flats where they find nutritious bitter brush to eat. This Huge 6x7 Bull Elk has less than 15 minutes to live. He is panting from being pursued by road hunters in pickups participating in the "Elk Reduction Program" in Grand Teton National Park. He is in an area that is for killing cow elk only. A white pickup full of hunters cut him off with their truck and turned him so that he crossed the road into the area for shooting bulls. He was shot and killed soon after. I took this photo yesterday. This "Hunt" is sanctioned by Teton National Park Officials and results in elk being shot by road hunters with no resemblance to fair chase hunting. 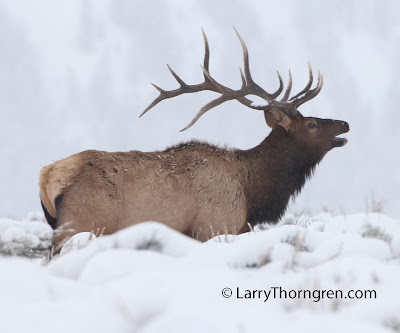 There is no justification for shooting bulls in this elk reduction program. If they want to reduce the elk numbers, only cows should be killed. This a money making "Trophy Hunt" disguised as a way to reduce the elk numbers..There has to be a better way to do this. Hunting in Grand Teton National Park is a bad idea. This is a horrible way to treat any animal. 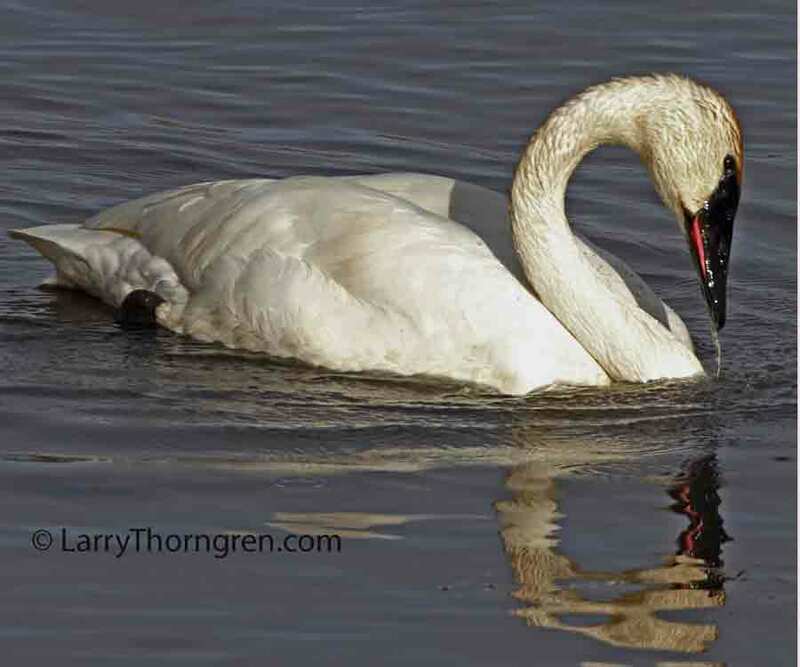 There were 30 Swans on Flat Creek in Jackson yesterday and 6 of them were close enough to photograph. I have lots of swan photos, but how could I resist when they were so close. I like these birds. They often show up at a hunting camp and can carry off an entire loaf of bread one small piece at a time. They are sometimes called "Camp Robbers". 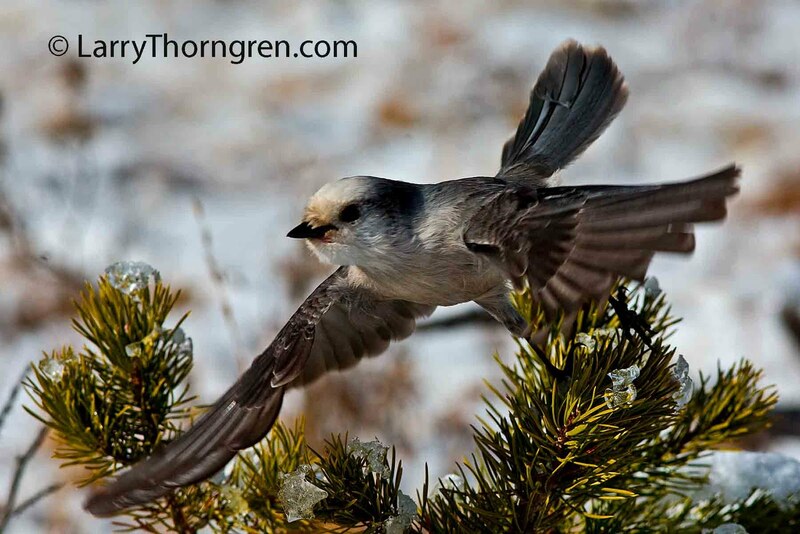 They are fearless and will land on your head if they can. This is the alpha female of the Canyon Pack. She has three pups, one black and two gray this year. They had just started swimming across the Yellowstone River when I saw them last about ten days ago. Yellowstone Wolf Researcher, Doug Smith, likes to put radio collars on all the alpha wolves in Yellowstone. I fear that when I see this wolf next year, it will have a gross- looking radio collar around its neck. Doug needs to leave these beautiful animals alone! 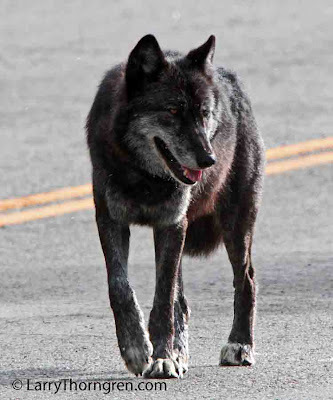 The Canyon Pack Wolves often use the roads in Yellowstone for travel. I photographed the black male of the pack as he trotted down the yellow line. 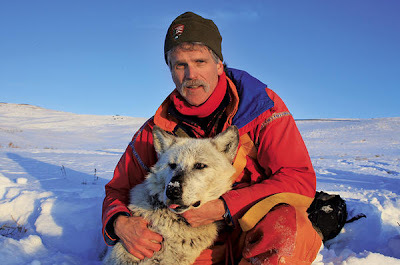 This wolf has a radio-collar, but it is not very visible from this angle. He seems much subdued compared to last year when he was not collared. Yellowstone Rangers often shoot members of this pack with rubber bullets when they see them on the roadways. They claim to be "conditioning them to not use the roads". It is part of the over-management of wolves and other wildlife by the park staff. Rubber bullets break ribs and can kill wolves at close range. Animals in Yellowstone are treated like farm livestock. I look for this wolf to be killed by other wolves this winter, since he is handicapped by the radio collar and will have a hard time defending himself when the Canyon Pack interacts with other wolf packs while following migrating elk. 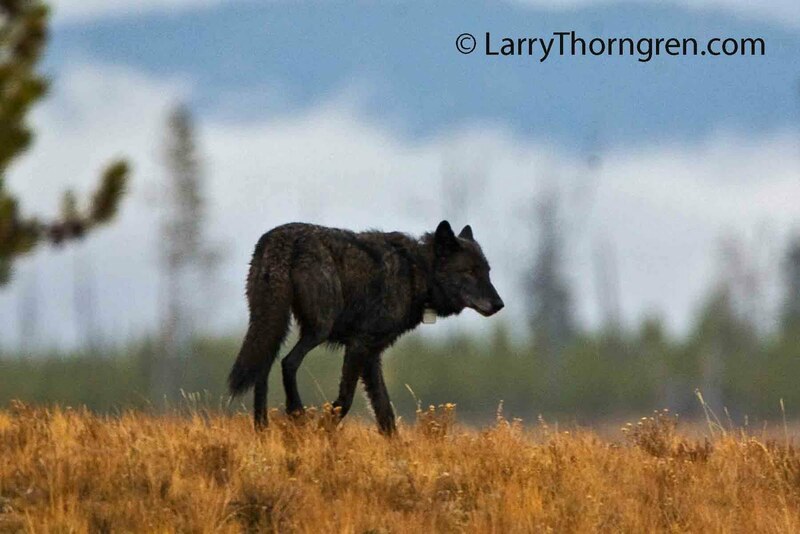 This wolf is a member of Yellowstone's Blacktail Pack. He is skinny and malnourished looking, which makes sense since he is handicapped by the ugly radio collar around his neck. This abuse of Yellowstone's wolves has been going on for over sixteen years. Seven hundred and fifty nine (759)wolves have been collared like this during the Yellowstone Wolf Project Study. If you add in the wolves that had collars replaced after the batteries failed, the number is more like eight hundred (800) or more wolves that have been treated this way. 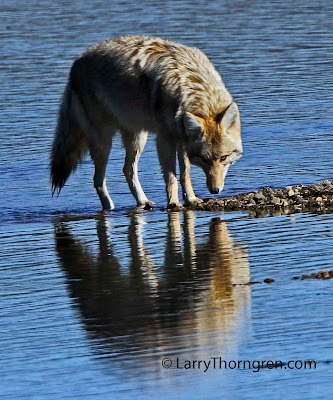 People that treat Yellowstone wolves like this deserve some jail time. Those that pay for these obscene collars should join them in jail. Yellowstone Park Officials who approve of and fail to stop this abuse should be jailed also. A Radio-Collared Wolf is a DEAD Wolf. 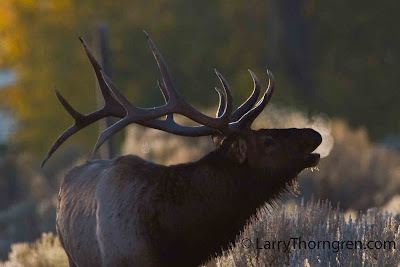 This Bull Elk is bugling while back lit on a cold October morning in Yellowstone. Bull Elk in Yellowstone are not collared as they used to be twenty five years ago, because enough visitors and photographers complained to the Park Superintendent about the practice. 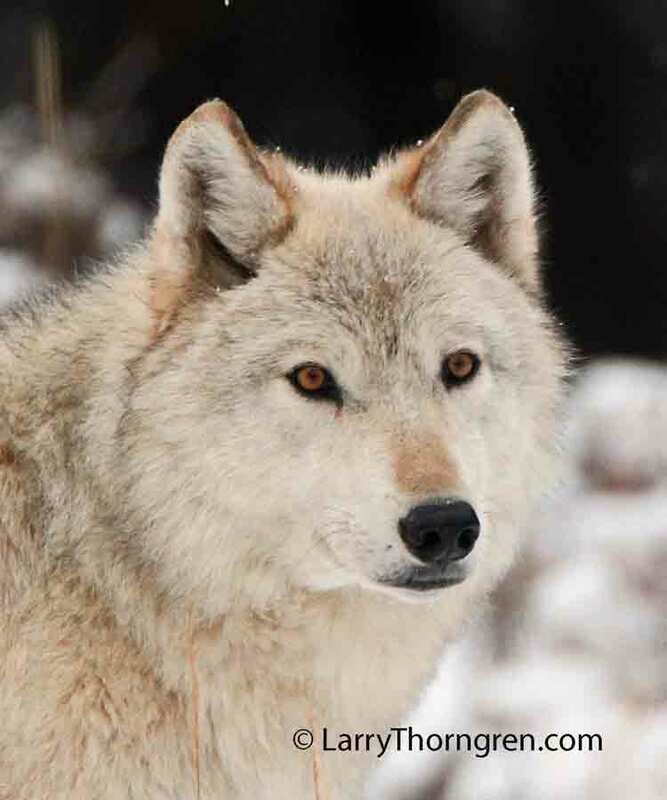 If enough people protest the collaring of Yellowstone wolves, maybe the collars will come off of them as well.